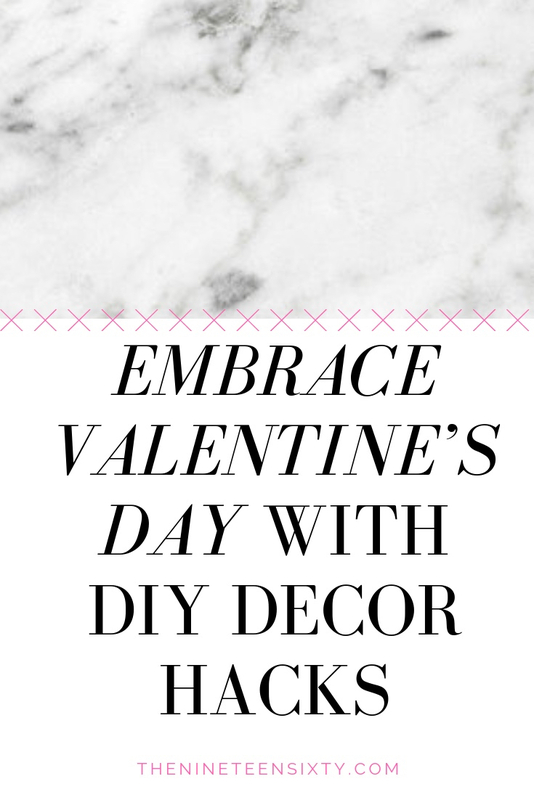 embrace Valentine’s day with DIY Decor Hacks — the nineteen sixty. Happy days of red and pink are upon us! Valentine’s day (and Galentine’s day!) are just around the corner and for some reason this year I am really getting into the spirit. Generally I don’t get all hyped up over it for all the reasons you’ve heard the cynics list before. I think after working in a grocery store for many years and having to lend a hand in the floral department for the ‘holiday’ I became skeptical of the intentions people had for the day. I am a firm believer that if you love someone you should tell them and shower them with love and kindness on any given day not just because Hallmark has cards out and the roses are coming in by the bucket full. But this year I am coming back around to February 14th and all the excitement. I really want to get little gifts for some of my favorite gals and send them a sweet surprise in the mail for galentine’s day this year. I don’t know about you but I love getting mail that isn’t junk mail or a bill so I try to make a habit of sending letters or little care packages to friends I don’t see often. It is just a totally unique way in today’s world to show someone how much you care about them. Get some red candies, a cute scarf, or a stationary set to send to your favorite gal and tell her how much you love having her by your side for all of your crazy adventures! I have also completely gotten into the spirit and decked out my room with some red and pink DIY’s and other cute accents. I’ll share all my DIY’s with you below and show you some of the extra red and pink items I found so you can get your house all valentine-d up! If you are looking for some more inspiration check out the board I made for Valentine’s day inspiration on Pinterest - it is so pretty! My closet doesn’t have any doors on it and my closet is super minimal so I have a lot of extra space to make it look even more like it is a normal part of my room. I have all my clothes on matching velvet hangers so it almost looks like a clothing rack you would see in a store. I have this big empty white space and I knew I needed to fill it with something especially since my closet mainly consists of gray, white, and black (plus this one pink sweater). One day I was aimlessly roaming through the craft store and I saw this glittery pink paper with tiny white hearts all over it. Kellie suggested I just simply put it in a frame and here we are. It looks so precious and the best part is I can just change out the paper any time I want for a new season or holiday. This DIY hack is also super inexpensive because we owned the frame and I only had to buy the paper which was $0.60. Even if you don’t own a frame you can get them very inexpensive at your local craft store and sometimes even the dollar store. I used a 12x12 frame to make a statement but you could always do a few smaller frames for a collection on a wall. Think of the possibilities - so many patterned papers to choose from! Do you remember this DIY? I made it in the fall with fabric leaves I had spray painted gold. I left the leaves through Christmas and January but I thought for February I would change it up a bit. I cut hearts out of a variety of pink and red papers I had (you can also find these papers at a craft store) and set them out in an assorted pattern I liked. I strung them with some red yarn and hung them at various lengths to match the wood circles. They look so cute! I’m seriously obsessed and I am going to be sad when I change the hearts to something new. I also changed the yarn the large drift wood is hanging from because I wanted the red to match all around. This DIY was super easy (especially considering I already had the actually wood hanging made) but if you want to make one for yourself check out our original post on it here! You can literally hang anything from the drift wood. You could do all wood pieces, add beach glass, or do paper hearts like me. Trust me this DIY is totally worth it. I love the way it hangs on my wall and adds a nature aspect to my decor. Plus I can change it up seasonally to spice things up! While we are talking about that wall hanging . . . take a look at how cute it looks with the shelf next to my bed! This is probably getting repetitive but I like things to be more minimal so my night stand/shelf is pretty bare and just has the basics on it. I love keeping a candle next to my bed because they create a relaxing atmosphere and I always have coasters because there is most certainly always a water glass around and maybe tea as well. And the tissues, well, it is winter and sometimes we get the sniffles plus they just add a wonderful pop of color in my white and gray bedroom. I also added the tiny fairy lights and wrapped them around through the shelves to add a little twinkle. I found these at Home Goods for $6 and they only take 2 AA batteries so they are super cheap, simple, and cute! 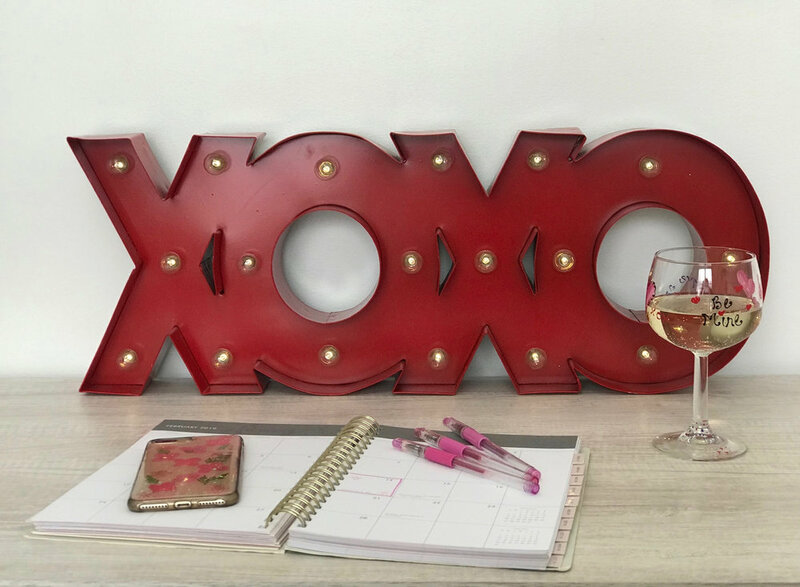 You can dress up your side table, desk, or dresser with lights and just a few pops of red and pink to get all the Valentine’s vibes this February. This DIY is not my original idea but it is something I have been meaning to do for a few years now. I think I originally saw this DIY with snowflakes and glitter on it for Christmas and winter and then a few weeks ago I saw it pop up on Pinterest with hearts for Valentine’s day. HOW CUTE!? Basically I just picked up sticks while Kel and I were walking Harrison and I stuck them in a mason jar. Some of them I had to trim down a bit and then we hot glued tiny pink and red hearts all over the twigs. I happened to find this pink tulle in the craft supplies so I tied it around the jar to add an extra flare but you could leave that out or even add some red and pink marbles or glass to the jar if you wanted extra color. I will link one of the bloggers here who have posted DIY on their site so you can read further instructions if you like! Don’t be afraid to make this your own! Another one of my favorite DIY’s I have ever done is this little heart garland. It is about 3 ft long and I spent way too much time making it. I made it last year but I wanted to add it in because I think it is so darling. So if you have some time to kill then this project may be for you! I punched out symmetrical hearts using a punch I own but you can also make your own stencil and hand cut the hearts if you like. Next you will take three hearts, fold them in half, and glue their backs together to form a 3D heart. I made nine 3D hearts and then decided to be super extra and dip the edges in glitter (because why not?) I used a touch of mod podge to get the glitter on the seams of my hearts. After they dried I used a needle and some thin string to string the hearts on but again I was extra and I added pink, purple, and white glass beads as I was stringing the hearts. I don’t have an official set of instructions for this DIY but if you’re interested in it more comment below or DM me on any of our socials and I can guide you through it! I am so glad I made it because it is so cute and I’ll pull it out every year! Storage tip: I didn’t want it to get crushed in a storage tote so I wrapped it on a velvet hanger and hung it in an area of my closet that it wouldn’t get damaged. OMG! How freaking cute is this light?! I seriously love it and honestly just stumbled upon it. Kel and I had bought this on clearance at Hobby Lobby about two years ago for a Harrison photo prop and it got pushed to the basement. When we were gathering supplies for this post and all of the DIY’s she noticed it and I immediately lit up. Again with my minimalist decor my desk is completely clear except for this XOXO sign and my planner or bullet journal if I am working. Check your local craft store or big box store especially close to the holiday or right after to score a good deal on one for next year. It makes me so happy and I wish I could keep it there all year. Thanks for letting me borrow your props, Harrison! Another way to dress up your home for low cost and low time commitment is to dress up your plants! We have a ton of plants all around our home so this is an easy DIY to add color your home. All you need for this DIY are skewers, pink and red papers, and a hot glue gun. Simply punch out pink and red hearts and glue them to the skewers. Pop them in your potted plants throughout your house for a cohesive, adorable, and inexpensive Valentine’s day decoration! My final tip for adding Valentine’s flare to your home is to collect any pink or red dishes you have and use them daily! Kel and I made these mugs a while ago and they make the perfect mug for Valentine’s coffee (or water) they are just so cute to drink from! You can also check thrift stores and flea markets for colored glass like this antique bowl we have our swedish fish candies in. The little splashes of pink and red in your regular every day items allows you to decorate but also stay pretty minimal and low cost. Love it! So gals and guys I hope you spread love into your homes with these DIY and decor hacks this Valentine’s day. I encourage you to send a valentine to the people who mean the most to you because everyone deserves a special piece of mail - be it on Valentine’s day or not. My 2019 motto is ‘a little more kindness; a little less judgement’ and I am exercising that this Valentine’s day (and Galentine’s day) by not hating on the day but by embracing it and spreading a little joy. be the love out there.